Acting Balanced: Christmas in July at Paper Coterie! 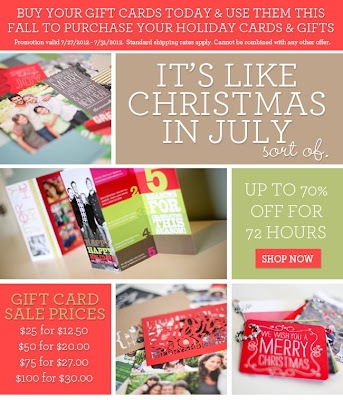 Christmas in July at Paper Coterie! If you're like me, you're already thinking about and planning Christmas - heck, I've already got gifts bought and stashed around the house... but I'm not quite ready to commit to buying my personalized holiday greeting cards yet... but I know that I'll want them... which is why I want to tell you about this fabulous offer from Paper Coterie! And even if you don't want to shop for Christmas, this is a great way to pick up a great discount for any future projects you're thinking about!!! Just remember - you only have 72 hours to take advantage of this great deal!